We can't begin to describe the hours we wasted as whipper-snappers desperately squeezing those tint plastic controllers, hoping that our Scalextric cars wouldn't fly off the track on the next corner. Scalextric was great, but lets be honest, it was less than realistic, and storing all that bulky track was a pain in the bum. Back then we dreamed of a racing game that was quick to set up, realistic in all the details, and that didn't require a corner of the shed all to it self. Fast forward 20 years, and our dreams have become reality. We review RealFX Racing. 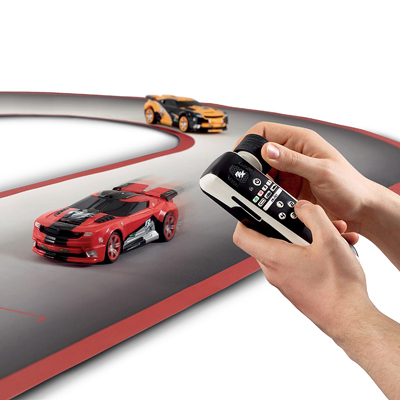 Here are your headlines: this is a physical racing game involving actual toy cars and RC controllers. 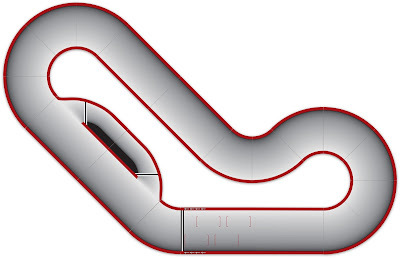 You set up the track, the cars go on, then you race around. Sounds simple enough, and not that much different to the aforementioned Scalextric. 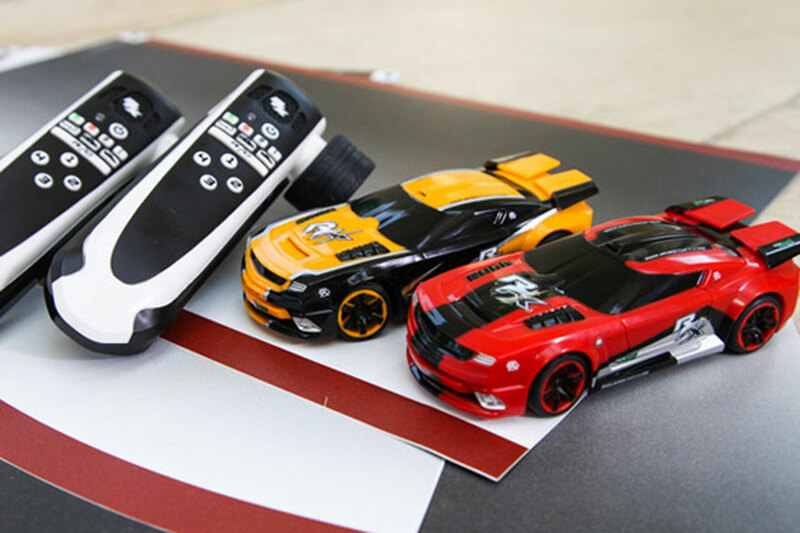 But... these cars are completely wireless, as are the controllers, and the track is made from super-thin plastic and completely slot-less. Yes, the cars can drive anywhere on the track. So, how isn't this just a simple case of small radio-controlled cars? Well, the cars, and the controllers, are exceptionally smart. Instead of just dropping the cars onto the track and hitting the accelerator, you get to pick what kind of race you would like. 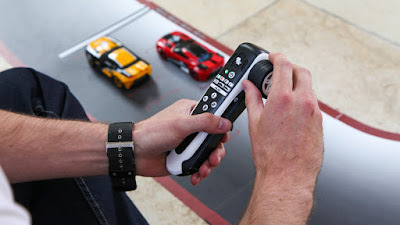 Should you wish to race in the tradition of the hallowed Scalextric, you can simply pull on the trigger and let the car guide itself around the track, with you worrying only about speed. The sensors in the car can 'see' the track, and know when a bend is coming. This was a great way to get acquainted with the set-up (and also a remarkable thing to see the cars steer themselves about!). The virtual fun to be had with Real FX Racing goes beyond keeping to the track. Should you wish, it is possible to set hazards during a race (such as an oil spill), which can be used either as random occurrences, or as weapons against your opponents. You can also decide to include mandatory pit stops, where your car will be forced to pull into the special pit section of track. Real FX Racing is so much fun its hard to fully describe. The winning formula here is the wealth of features and modes of the racing set, making it several different games in one. The track slots together in minutes and (crucially) can be flat-packed away, taking up no more space than a coffee table book. We also loved that, even with all the extra features switched off and the track put away, Real FX Racing includes two very good wireless-controlled cars which, when in RC mode, are great to drive around freestyle. After finally playing with Real FX Racing it is easy to see why the Kickstarter campaign was so successful. This is a great toy for kids of all ages and is sure to be a big winner come Christmas.